Stay for one week or more at our Volcano and Rainforest Service Base outside of La Fortuna, Costa Rica. This program provides a great introduction to tico culture and service in rural communities. Participate in a variety of projects, from improving schools, to working in a National Park, to engaging in learning activities with local students. Outside of service, you’ll have the opportunity to visit natural hot springs, zip line, and go whitewater rafting. Make friends with students from around the world on this popular base program. Students staying at our Volcano & Rainforest Base will have the opportunity to participate in a range of community initiatives that we support in the La Fortuna area. These projects are designed in close collaboration with our local partners to support community goals. Students are assigned to project teams and will rotate through the initiatives outlined based on the needs of each project during their program. We work with local community schools that incorporate English as a second language into their curriculum. This project aims to create an intercultural experience for the Costa Rican students and our Rustic students. The Language Exchange and Cultural Immersion (LECI) program promotes cultural awareness by creating a forum where Costa Rican and Rustic students alike can exchange their cultures, values, and perspectives in a safe and open environment through different activities that focus on teamwork, communication, citizenship, and intercultural competence. Costa Rica is world-renowned for its dedication to environmental protection and we support a number of local initiatives working to protect the natural environment and promote sustainability. Contribute to projects at the Arenal Volcano National Park focusing on trail maintenance, small construction projects, and making and placing landmarks. We partner with schools in two districts around La Fortuna to support infrastructure improvements that create brighter learning environments for students. Schools receive limited funding from the government and communities work hard to provide additional support to boost their children’s educations. You will work on small scale construction projects that in the past have included building new classrooms, installing tile floors and windows or adding a fresh coat of paint. Residents in communities outside of the touristic town of La Fortuna rely heavily on agriculture as a source of income and have limited resources to support their priorities for community development. We have partnered with several rural communities to support these goals and you will work alongside community leaders to undertake building projects. In the past these have included initiatives such as construction of a tilapia fish farm to generate additional funds for the community and a kitchen for a community center to support local events. Depart the U.S. en route to San José, Costa Rica. Upon your arrival, Rustic Pathways Staff will greet you at the airport. Head to your lodgings for the night and spend the first evening meeting new friends and mingling about with students preparing for our many enriching programs. Good luck and enjoy your stay in beautiful Costa Rica! After breakfast, get with your respective work group and leave the base to work on one of the exciting and rewarding projects in the surrounding communities. Work will be divided into community improvement projects, educational facility development, and green initiative projects. After a productive morning, return to the base house for a fantastic lunch. Take a siesta or jump in the pool for a quick swim before leaving to continue working on the service projects in the afternoon. Wake up for an early breakfast, and then have another significant and productive day with different community service projects. After dinner, enjoy a relaxing visit to the hot springs after two full days of hard work! After a nice breakfast, get ready for a day full of scenic beauty and head out to the zip line through the rainforest canopy where you can observe the magnificent Arenal Volcano and the artificial lake that runs a dam for hydroelectric power in the country. After lunch you will have time to walk around town and go souvenir shopping. Then get ready for a typical tour that will take you through the roots of Costa Rican culture with typical activities, music and Costa Rican cuisine that you’re going to love. After breakfast, get ready for an intense day of adventure! You will be off to go whitewater rafting on the famous Sarapiquí River (class II & III). Those who do not want to join the tour can spend the day relaxing at the base or shopping in La Fortuna. After rafting return to the base house where you can take a nap or use the swimming pool before you start preparing for our Language Exchange and Cultural Immersion program with a local school. At night you will have an activity at the base house with the entire group that you will enjoy! Wake up for an early breakfast, and then head out to work in your community service projects for one last full day of work. At night enjoy a closing ceremony that will get you closer with all your new friends. After breakfast you will work on our Language Exchange and Cultural Immersion program with local students. Return to the base for lunch and then pack up for the return to San Jose. We will have a halfway stop along the way for last minute souvenir shopping and some snacks. It’s time to say good bye to Costa Rica and head home or on to another exciting Rustic Pathways adventure! A school backpack or similar sized bag is ideal. 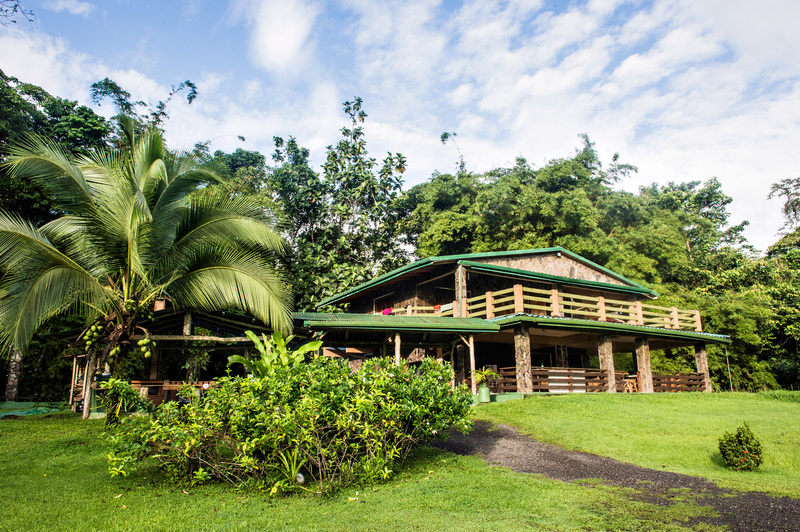 Participants will be staying in our Volcano and Rainforest Service Base. This property has two fully equipped houses located 15 minutes away from the town of La Fortuna and is one of the most comfortable accommodations out of all our Costa Rica programs. Both houses have flush toilets, electricity, bunks beds, fans, and hot showers. They share a fresh water outdoor pool, soccer field, volleyball net and many other amenities! Participants will be eating a good variety of food during the buffet style meals served at the Volcano and Rainforest Service Base. Breakfast usually includes eggs, bread, cereal, milk, juice and fresh fruit. Lunches and dinners range from traditional Costa Rican meals such as chicken, steak and fish dishes, rice, black beans, potatoes, plantains, salads, and pasta; to more familiar dishes like barbeques and burgers. Water from the tap is safe to drink in this program. Don’t forget to bring along your own reusable water bottle, so we can minimize our plastic usage. Students should be prepared for hot, humid weather in the 80s and 90s (Fahrenheit) during the day with occasional rain showers. Since the base is located in the mountains, the temperature will go down into the 70s in the evenings. The weather does not vary much between June and August. Synthetic fiber clothing is recommended, because it dries quickly. Students should bring $200-250 in order to allow them to do participate in add-on activities, should they choose to, and have some money to do souvenir shopping. Leggings or yoga pants: Only if paired with a long T-shirt. Loose-fitting pants and capris: Acceptable and preferred. If you arrive and your clothing is deemed unacceptable by your program leaders, you’ll have to purchase appropriate clothing before service work begins in the villages or the local schools. Students will have the opportunity to do laundry once during this trip. The cost is $5 per load. As we work closely with our local communities, these service projects will be determined in late spring in conjunction with our local partners and based on current needs. Typically students will be involved in an infrastructure development project as well as interaction with students at the local primary school. Prepare to get your hands dirty during these incredibly powerful projects! The service projects in this program are appropriate for most physical activity levels. Students should be prepared for moderate physical activity including lifting heavy materials, shoveling, digging, mixing cement, woodwork, and other manual labor during the construction projects. Rubber boots are suggested for community service projects. Will students be studying language? This program does not include formal Spanish language instruction, however, students will have multiple opportunities to practice Spanish with the local students and other locals involved in the community service projects.